The cartoon work of Emmy Lou Packard, modern in its simplicity, suggests the work of many mid-century modern animators who would work in the 1950s. An exhibit of her work runs in Richmond from September to January. Examples of Emmy Lou Packard's World War II-era cartoons. Her cartoons are simple, direct, often touching, sometimes funny—quickly understood, easily forgotten. Or are they? 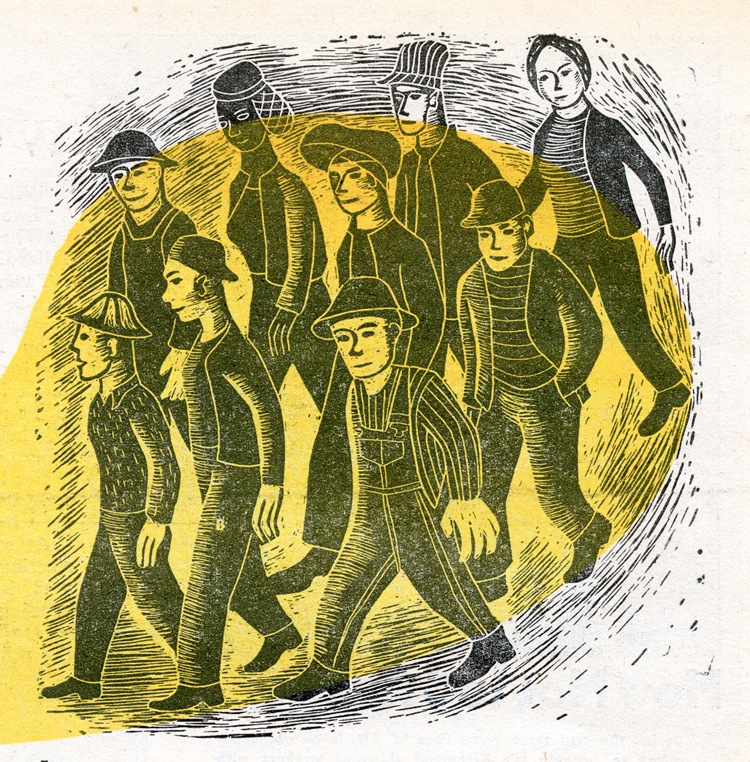 Emmy Lou Packard, an accomplished fine artist both before and long after World War II, spent time during that conflict working at Henry Kaiser's Richmond shipyards as a draftswoman helping design transport vessels. 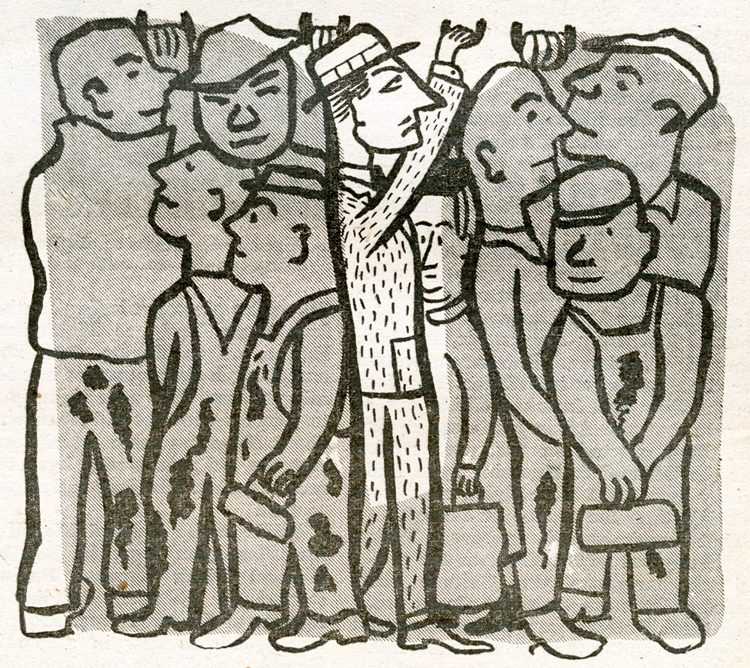 She also found time to produce superb paintings of shipyard scenes—and contribute cartoons to the shipyard paper, Fore 'n' Aft. A collection of these delightful drawings will be on display into January right where they were produced, at the former shipyard site. 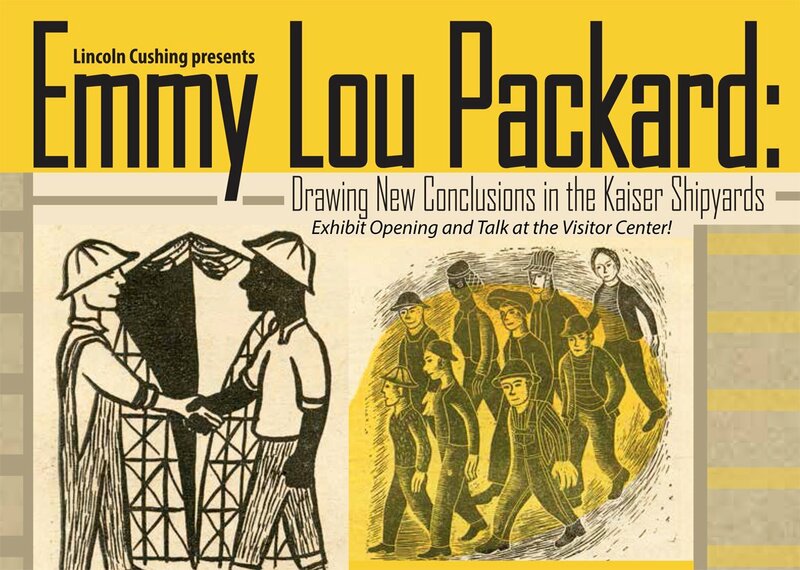 The display, 'Emmy Lou Packard: Drawing New Conclusions in the Kaiser Shipyards,' will be at the visitor education center of the Rosie the Riveter World War II Homefront National Park, 1414 Harbour Way South, Richmond. There will be a free reception for the exhibit on Saturday, September 5, 11 a.m. to 12:30. Lincoln Cushing will give a slide show about Packard and the shipyard scene. Reservations are required for the talk, but not the reception, because space is tight. Call 510-232-5050 extension 0. Packard's son, Donald Cairns, who watched as his mother drew, will be there as well. Packard's cartoons are modern in their simplicity and deliberate air of the child-like, suggesting the work of many mid-century modern animators who would work in the 1950s. Emmy Lou Packard, who later lived in Mendocino and San Francisco, died approaching the age of 85 in 1998. Packard, who came from two generations of political activists, was committed in her art and in her life to radical social change. Her husband, Burton Cairns, also had a social conscience, as an architect who designed subsidized housing for workers for the Farm Security Administration. Packard's drawings for Fore 'n' Aft, either standalone panels, illustrations for articles, or spot fillers, reflect how the workforce was changing during the war, when women were suddenly working industrial jobs, and black workers were often working alongside whites from the South. "The media had to change, the shipyard newspaper had to change," says Cushing, a well-known collector of political posters, and a historian and the archivist for Kaiser Permanente Heritage Resources. Making jokes about women was no longer funny, he says. "It was women working there now." Among Packard's creations was a series featuring 'Shirley the Whirley,' a humanized version of the shipyard's whirley cranes that moved large hunks of metal about. One of the cranes still remains at the National Park, a short walk from the visitor center. When Packard left the shipyards, she was honored, Cushing says. "They said she really represented the people who worked there, and she really understood their hopes and aspirations." "Packard's lengthy obituary in the San Francisco Chronicle mentioned the approximately 100 paintings she made of shipyard scenes, but said nothing about her work on Fore 'n' Aft," Cushing has written, adding, "until now no comprehensive survey of those illustrations has been available. The display will not feature the original cartoons, but will show digital blowups instead, because the originals were simply too small to display, some not much bigger than postage stamps. Being in a gallery setting will change how these drawings are perceived, Cushing suggests. "We want to appreciate them as art," he says. For more on the Emmy Lou Packard exhibit and talk, click here.